After former Governor Arnold Schwarzenegger nominated her as Chief Justice on July 22, 2010, the California State Bar Judicial Nominees Evaluation Commission rated her as exceptionally well qualified for the position. At a public hearing on August 25, 2010, she was unanimously confirmed by the Commission on Judicial Appointments, and in a general election on November 2, 2010, an overwhelming majority of voters elected her to that position. Chief Justice Cantil-Sakauye chairs the Judicial Council of California, the administrative policymaking body of state courts, and the Commission on Judicial Appointments. For more information read about her recent outreach activities and civics initiatives. She has served for more than 20 years on California appellate and trial courts, and has been appointed or elevated to higher office by three governors. In 1990, Governor George Deukmejian appointed her to the Sacramento Municipal Court and in 1997, Governor Pete Wilson elevated her to the Superior Court of Sacramento County. On the superior court, she presided over both criminal and civil assignments. In 1997, she established and presided over the first court in Sacramento dedicated solely to domestic violence issues. In addition, then-Judge Cantil-Sakauye chaired the court’s criminal law committee and was a member of the presiding judge’s task force on domestic violence and the Home Court committee. In 2005, Governor Schwarzenegger nominated her to the Court of Appeal, Third Appellate District. Born in 1959 in Sacramento, Chief Justice Cantil-Sakauye attended C. K. McClatchy High School (1977) and Sacramento City College (1978) before receiving her BA from the University of California, Davis, graduating with honors in 1980. After taking a year off to visit her ancestral homeland, the Philippines, the Chief Justice entered the UC Davis, Martin Luther King, Jr., School of Law in 1981. After receiving her JD in 1984, she worked as a deputy district attorney for the Sacramento County District Attorney’s Office, where she prosecuted a variety of criminal offenses. From 1988 to 1990, she served on the senior staff of Governor Deukmejian in two capacities: first as deputy legal affairs secretary and later as a deputy legislative secretary. 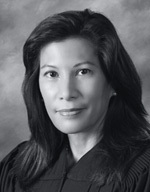 Chief Justice Cantil-Sakauye is a former board member of several nonprofit organizations and has been active in numerous professional community organizations, including membership in the California Judges Association, the National Asian Pacific American Bar Association, and the Sacramento Asian Bar Association, and received the Filipina of the Year Award. She is currently a member of the Board of Directors for the Conference of Chief Justices, The American Law Institute, the Board of Visitors for UC Davis, an Advisory Board member of the Sacramento Federal Judicial Library and Learning Center Foundation, an honorary member of the Foundation for Democracy and Justice, a private nonprofit organization devoted to civics education, and is actively engaged in a civic learning initiative Your Constitution: The Power of Democracy. Chief Justice Cantil-Sakauye is married to Mark Sakauye, a retired police lieutenant, and they have two daughters.